Unabridged Audiobook, 11 hrs., 9 Min. 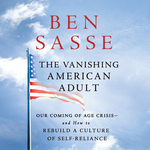 In The Vanishing American Adult, Sasse diagnoses the causes of a generation that can’t grow up and offers a path for raising children to become active and engaged citizens. He identifies core formative experiences that all young people should pursue: hard work to appreciate the benefits of labor, travel to understand deprivation and want, the power of reading, the importance of nurturing your body—and explains how parents can encourage them. Our democracy depends on responsible, contributing adults to function properly—without them America falls prey to populist demagogues. A call to arms, The Vanishing American Adult will ignite a much-needed debate about the link between the way we’re raising our children and the future of our country. The first third or so is Sasse laying out the problems with the 30-and-younger set (and the parents and grandparents that got them and their society in the sorry state they’re in). The next two-thirds are his suggested solutions, what he believes parents can do to help raise a generation with the necessary rigor and grit to make it. Nothing here can be implemented like blueprints — these are all just things to get parents thinking. Even if the reader disagrees with Sasse (as I do frequently), you get the feeling that he’s more concerned with people and parents thinking about these ideas and doing something about them, even if it’s what he doesn’t think needs to be done. There’s a chapter devoted to helping our children and teens become critical readers — talking about the necessity of being more than just functionally literate, but people that interact with books — good books, as well as entertaining books. People reading this blog should find a lot to love (and a little to demur with) in this chapter — I almost listened to it twice in a row it was so good. The book is largely a-political. Yes, politics does enter into it. Yes, if you agree with him (before or after reading the book), it’ll likely lead to certain political moves — but people on all points on the political spectrum should be able to get something out of this book. Just because Sasse is a U.S. Senator, don’t think that this is a book about that. He does highly value “republican” values — but he usually goes out of his way to stress that it’s “small-R republican” he’s referring to. Ditto for the Christian point of view he writes from — Sasse’s very up-front about that, but goes out of his way to show how non-Christians (or even Christians from different traditions) can agree with much of the book, or disagree constructively. There was problem with the audiobook — there’s no text to refer to. There’s so much that you want to go back and re-read, notes you want to take, quotations/citations you’d like to double check. The literature chapter alone needs to be re-read. And it’s just such a pain to do all that with an audiobook. Trust me, get the hardcopy. The audiobook is a very effective advertisement for the hardcover. It is good to hear Sasse read this himself. There’s a lot of this book that I just don’t get — I’m not saying he’s wrong, necessarily, but I don’t think he’s always as right as he thinks he is. But I’m telling you, I thought a lot about what he talked about — I talked a lot about the content of this book. I’m looking for ways to put some of this into practice, and wish I’d done a better job of doing it years ago. Agree with it or not, this is a book well worth reading.